pipe cleaners and googly eyes. : Bike Ride To The Moon. Bike Ride To The Moon. I slept hard. Since arriving, my sleep pattern has been a bit off, most likely due to combination of adjusting to the times zone and the constant noises of the tooting horns, barking dogs, or the echoed alleyway conversations. Deciding to book at the Buddha Maya Hotel was a good move as I can recharge…Quiet nights and hot Showers. Nepal is beautiful. At the surface it isn’t so different from India; they drive the same way, there are dogs everywhere, they dress the same way, and they even speak in a very similar way. Much like how parts of Canada and northern US or Mexico and southern US, there are subtle differences at first glance. Being here for only a night I’m starting to see past the subtleties and already notice a very different culture. Last nights rickshaw ride through the gardens, gave me the opportunity to talk to my driver, Raju. With his WWF ‘John Cena’ T-shirt and oily hair, he looked no different from some of the other younger guys I’ve met on my trip, except his attitude seemed different… he appeared to be very happy and rather laid back; I could tell that he wasn’t trying to rip me off. The security guard at the Maha Devi Temple was saying how he felt that while most Nepalese and Indians look the same, they act and think very differently; the Indian majority having a ‘corrupt and apathetic’ mentality where as he felt that the Nepalese are more about helping. I don’t necessarily agree, as I feel that to a certain extent the further I get away from the big cities, the hospitality of people has been more exhibited. Lumbini was no exception as everyone was very outgoing and nice. Perhaps the provincial life has very little room for corruption. Today I rented a bike from the hotel. It was awesome. As much as I wanted to give Raju business again and ask him more questions about Nepal, I couldn’t refuse the idea of being able to bike here! 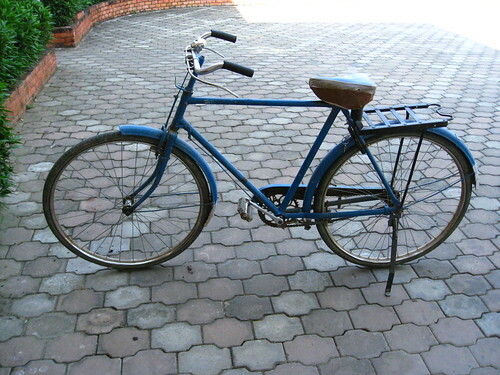 The bicycle was a banged up, old blue, rickety thing with wobbly handlebars, and an old spring seat. She was beautiful. I biked through the gardens heading to the places I didn’t get to go to last night. The large World Peace Pagoda on the northern most area of the park was my first stop. The massive white dome, which could be seen from the eternal torch, had three tiers. 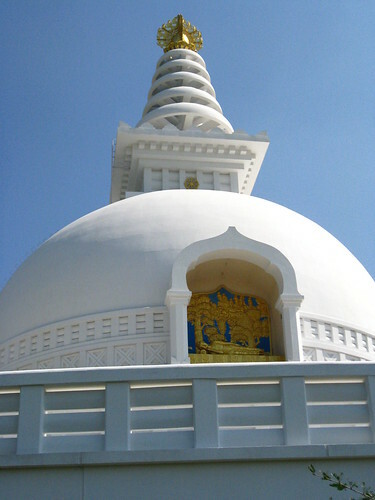 I circumambulated each tier, 3 times each for taking refuge in the triple gem: The Buddha, The Dhamma, and The Sangha. After I was done, the glaring sun was starting to reach high noon and the white stupa had nothing more to offer me, except for a potential sun burn. I stopped in at a small stand in the parking lot and bought some biscuits and had an orange Fanta; I’ve forgotten how good soda, without corn syrup, tastes. I continued biking and exploring the gardens, stopping in at all the different monasteries that were open to the public. 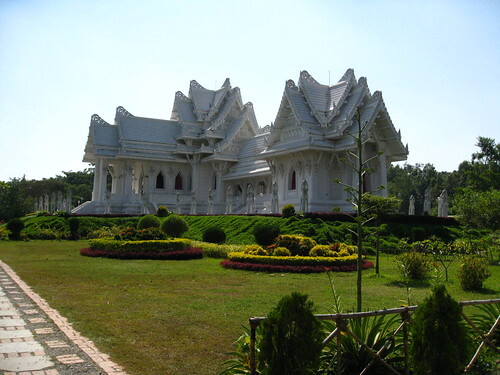 The Thai Monastery was fantastic; the white temple was something that I had never seen before and combined with the typical jagged architecture, it looked like it was from outer space. I became pretty hungry and decided to go back to the small restaurant that I ate at last night; the momos were actually a little disappointing… I think the momos from the Himalayan Restaurant back home, are much better. I look forward to eating my post Dharma Punx – momos with the gang, when I get back. After stopping for lunch, I asked where the nearest Internet centre was; extending the time to bike outside of the gardens, I peddled my way 3km to the small neighboring Parsa Bazaar. A little nervous, but I guess what ever happens, happens. 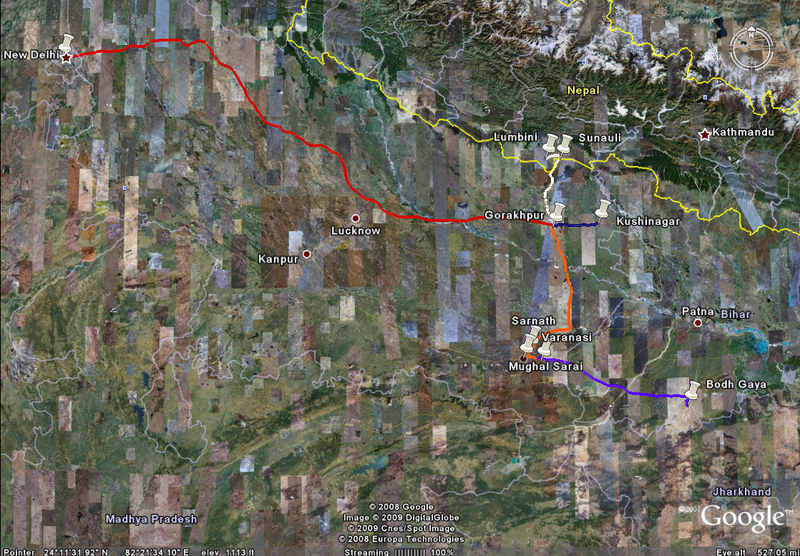 I leave Nepal tomorrow morning to head back to India and back to Gorakhpur via bus. 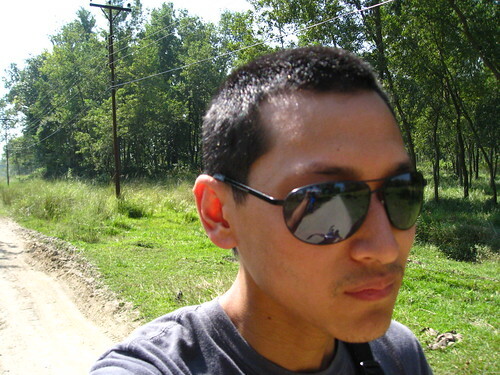 I would like to come back to Nepal in the future, it’s so beautiful.